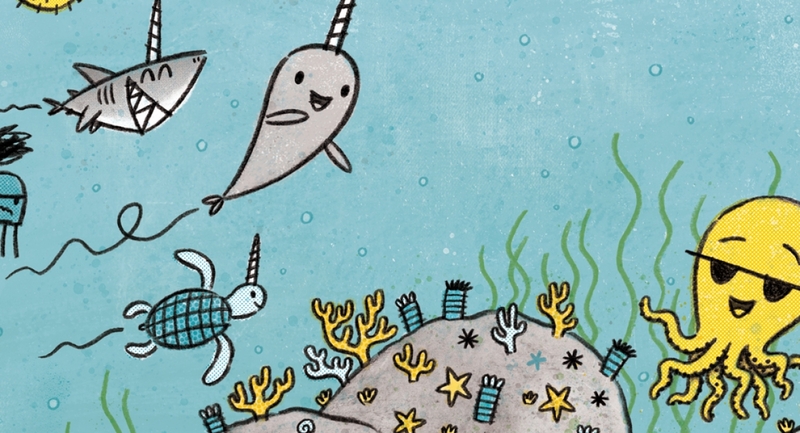 Summary: Narwhal is a happy-go-lucky fellow with a perpetual grin on his face (right under his horn). He meets up with the more serious Jellyfish (“Jellyfish? Hee hee! That sounds funny!”), and the two become unlikely friends. There are three stories in this beginner graphic novel. 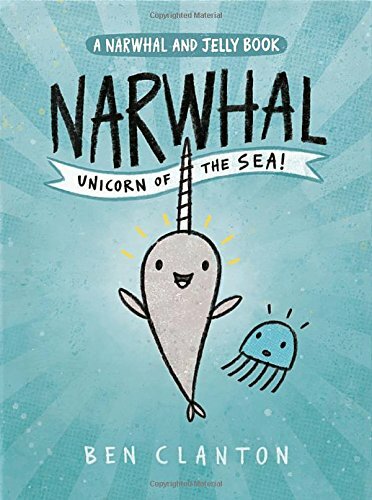 The friendship happens in the first one; Narwhal delivers horns to various sea creatures and creates a pod (“Podtastic!”) in the second; and Narwhal shows Jellyfish how a blank book can be an interesting read in the third. In between the first two stories are two pages of Really Fun Facts about narwhals and jellyfish, and in between the third and fourth is “The Narwhal Song” which involves limited lyrics and a considerable amount of hand clapping. Good news for fans: it looks like the second Narwhal and Jelly Book will be out next May. 64 pages; grades K-3. Pros: Elephant and Piggie aficionados will enjoy stepping up to the world of Narwhal and Jelly. The humor is similar and the reading just a level or two above. Cons: The artwork is pretty primitive with a somewhat limited palette.